What does membership at St Chad’s offer? 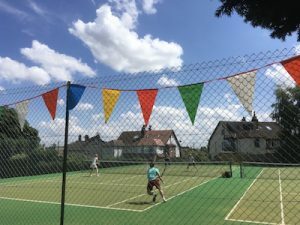 There was a very good turn out for the first Karen Wignall Ladies Doubles Tournament held on Sunday 30th September 2018 – Karen would have been delighted to see so many players enjoying an excellent morning’s competitive (yet friendly) tennis followed by copious amounts of cake and bubbly. It was a close-run affair! Partners Heather and Sophie had to play a tie break against Renske and Gail for a place in the finals; the latter couple triumphed. 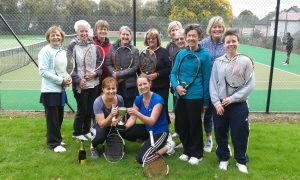 Gail and Renske went on to become worthy joint winners of the Karen Wignall Cup beating other finalists Anne and Jenny. 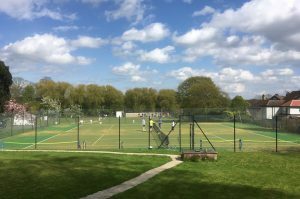 We all thoroughly enjoyed what we are sure will become a popular annual St Chad’s Tennis Club event in the years to come. AND we raised £140 for St Gemma’s in the process. 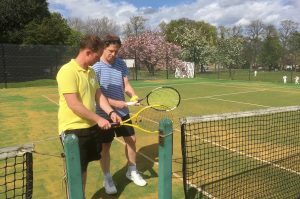 The men ran a parallel tournament up at Leeds Beckett Uni’s courts. One of the winners (Mahesh) can be seen playing more tennis in the background of the above pic, obviously not worn out by his earlier victory. First internal tournament winners for 2018!